Manufacturer of tiling and flooring products for the trade, Dunlop, has made a significant investment in its sales and support teams following a period of growth in the market. The Stoke-on-Trent-based manufacturer has more than doubled its sales team from five to 12, while additionally creating a new training and technical support team of five. Keiron Birch (West Midlands and Wales), Andy Oates (London) and Nick Harman (Hants, Surrey and Berkshire). Also joining is Simon Harding who will act as regional sales manager for East Anglia. 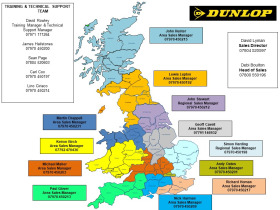 To accommodate the expanded team, current Dunlop ASMs have had their areas of responsibility reorganised as follows: Michael Maher, Midlands and Wales to M5/M40 Corridor, Beds, Bucks and Herts and Richard Homan, London and South East to Kent and Sussex. Paul Glover will remain as ASM for the South West, while John Stewart has been promoted to regional sales manager and will look after the Yorkshire area and certain key accounts. In addition, Debi Boulton has been promoted to head of sales from sales and marketing manager. Commenting on the investment, Ms Boulton said: “The addition of seven new members of the sales team means that we can cover more areas of the country and provide a greater of level of support to our merchant customers. This means more face-to-face visits, more trade events and more product training. The new Training and Technical Support team will be led by Dave Rowley, SkillBuild judge and training manager at Dunlop, and will assist the area sales managers for larger trade events, training for end users and trade counter staff on-site and at Dunlop’s Innovation and Technology Centre, and technical support for larger projects. “Training and Technical Support continues to be at the forefront of what we stand for as a trusted manufacturer for the trade,” added Debi. “Having a dedicated team means we can provide additional support for tradespeople and merchants – including more practical and bespoke training courses on tiling and flooring techniques and our range of easy to use products.